My oldest is in another food phase. Currently he has decided that he isn't eating cheese. It's somewhat amusing since cheese used to be one of his favorite foods, but now he will pick it out. My guess is that he has learned some of these habits from my husband and I . While we both love food we also have definite opinions on what we do and don't like. For example my husband eats a vegetable and beans at every meal as part of his diet. I am horrible about vegetables. I eat more than enough fruit, but I only eat vegetables at dinner (this will be one of my food habits that I will be working on in the next year). My husband is the opposite, he can eat more spinach than anyone I know, but hates any fruit. So I try to find foods that everyone in my family can compromise upon. Tomatoes and pasta are two foods that my family absolutely loves. Tonight I tried a new recipe for Roasted Tomato and Pancetta Pasta from the Everyday Food insert of the March 2013 issue of Martha Stewart Living. This recipe has 7 ingredients. It takes 30 minutes of total time, 10 minutes of which is active and makes 4 servings. I did make a few changes to the original recipe. First since I eat gluten free I used gluten free pasta. Second my store doesn't carry cherry tomatoes during the winter so I substituted grape tomatoes. I also increased the cooking time by ten minutes, used canola oil instead of olive oil and pressed down on the tomatoes after they were roasted to ensure that they were fully burst. Finally, I topped the servings with goat cheese. My oldest son loved this recipe. He ate his whole serving, which is the most he has eaten for dinner in weeks. My husband liked the flavors, but thought that the total amount of pancetta should be doubled or swapped for uncured chopped bacon. Then again the males in my family think that everything needs more bacon. I did not add the extra pasta water at the end, but instead poured the juices from the roasted tomatoes into the pasta, which created a nice flavor. For the recipe go to Roasted Tomato and Pancetta Pasta. My kids think the color green in food should automatically make it inedible (sigh). 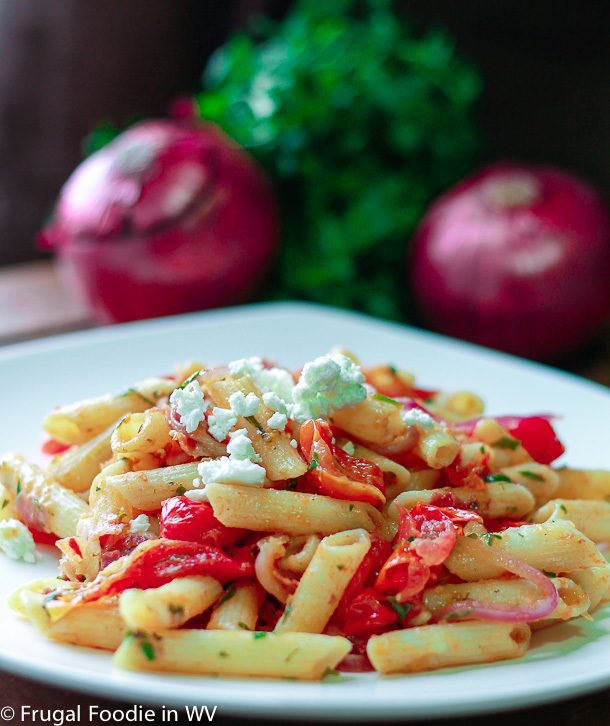 Roasted tomatoes are divine with pasta. My oldest has gone through those phases also, it's normal :) I agree about roasted tomatoes and pasta, they are great together! super yummy! its really mouth watering. I simply love your recipes.. Funny, I eat more vegetables during lunch than I do at dinner. Also, more bacon is needed with everything! I have been good about eating veggies for breakfast and lunch the last couple of days. I do think that I feel better, so I am slowly working on it :) I agree about the bacon! I love that it is only a 30 minute recipe. Sometimes I just don't have the time to cook! I love easy flavorful recipes also, especially during the week! Hi from the Aloha Blog Hop! This looks DELISH, marking this to come back to. Following you now. Thanks :) I already follow you, come back and visit again soon! I plan on trying this - it looks delicious. I will add my twist to it! ha! ha! Thanks for sharing another wonderful recipe! Thanks :) If you try it tell me how it goes! Thanks for the follow, already follow you :) Come back again soon! My veggie problem is that I like them raw way better than cooked. I wish it was the other way around. I agree about liking them raw better. I am the same way, especially with carrots! This looks absolutely delis! Thanks for sharing... following you now. Thanks for the sweet comments :) My two sons loved this recipe! We eat a lot of pasts also, it's a family favorite! Italian food is a family addiction. Thanks for posting this recipe and thanks for sharing at Family Fun Friday! We love it also :) Thanks for hosting! I didn't cook when my husband and I were first married either :) Since I stay at home I cook a lot to save money and prevent the health problems that my mother had. Thanks for stopping by!